Goodreads Summary: The day Louisiana teenager Rory Deveaux arrives in London marks a memorable occasion. For Rory, it's the start of a new life at a London boarding school. But for many, this will be remembered as the day a series of brutal murders broke out across the city, gruesome crimes mimicking the horrific Jack the Ripper events of more than a century ago. When Rory's parents told her that she could pick where she went to school for her senior year, she chose a boarding school in London. It's a hard enough adjustment for her to get used to a new city, a more advanced school, and living with a roommate. If that's not bad enough, someone has started recreating the murders of Jack the Ripper, and Rory's boarding school is in the area near the crime scenes. And then things really get strange. Rory sees a man that nobody else seems tobe able to see, not even her roommate who was with her. Then she gets a second roommate who never seems to do any schoolwork. Finally, there's a mysterious boy who always seems to be hanging out in the library. As Rippermania continues to sweep the city, life becomes increasingly more complicated for Rory. Could it be that she's the murderer's next target? And if she is...why? First of all, I love books set in foreign cities. I've only spent a few days in London, so it was great to explore more of this city in this book. I really enjoyed the history that was incorporated in this book. This book revolved around Jack the Ripper's infamous murders, and we were not spared any of the details. Although this book is from Rory's point of view, occasionally an outside perspective would be introduced that added to the heightened sense of Rippermania, which I found very effective. I also appreciated how the mystery is not as cut and dry as it first appears. There is more to the murderer than just his elusive qualities. There is, in fact, an entire world of ghosts and secret police hidden in London into which Rory finds herself inducted. This added paranormal element really made the book intriguing. I enjoyed getting to know the characters in this book and learning more of their backstories. When the action seemed stalled, the interaction among the characters balanced this. I did have one complaint about this interaction, however, and that was the romance between Rory and Jerome. It seemed almost out of place; I would have liked to have seen it developed more. I was also slightly disappointed with the murderer's reasoning behind his actions. While there is some closure at the end of this book, there is also an unexpected twist that should be interesting to watch play out in the next book. 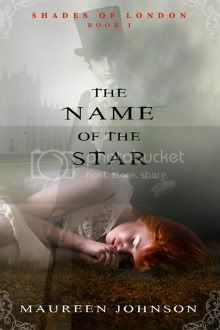 Complete with interesting characters, unexpected plot twists, and a little bit of history, The Name of the Star will keep you guessing and keep you reading right until the very end. I'm looking forward to seeing what happens next! Nice review! I'm fascinated by serial killers, so this book sounds perfect for me. Plus, I just love the cover. And I'm pretty sure I'll be reading up more on Jack the Ripper once I'm done with The Name of the Star. Can't wait to read it! Interesting review! I picked this one up at MBTB last weekend and can't wait to dive into it. The cover is gorgeous! I agree, stories set in foreign cities are especially interesting. You definitely make me want to start reading The Name of the Star right away.